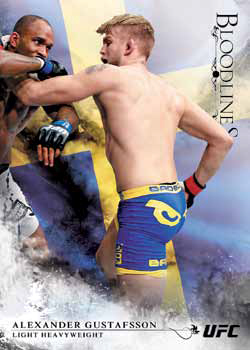 One of the most popular MMA trading card lines, 2014 Topps UFC Bloodlines uses nationality and lineage as a backdrop for a hits-focused release. Every mini box-style pack comes includes either an autograph, memorabilia card or manufactured relic. The product has several autographed inserts. Fighter Autographs are simple, focusing on the subject and their signature. 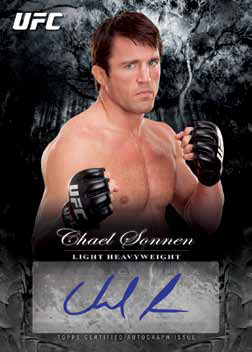 New signers get a "First Issue" stamp, which is customary in Topps UFC sets now. Base versions are numbered, as are the Ruby Red (#/8) and Platinum (1/1) parallels. 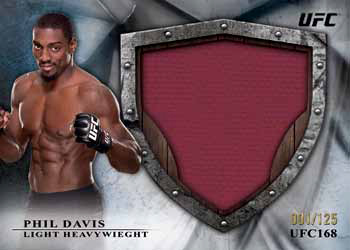 2014 Topps UFC Bloodlines has a pair of dual-autograph inserts. Kindred Combatants (#/25) look at two fighters who have similar skill sets. 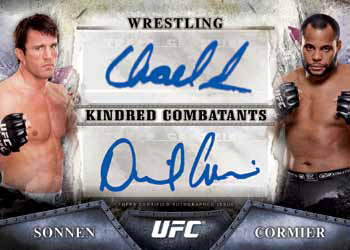 Bloodlines Dual Autographs (#/25) pair two fighters from the same country. The golden ticket of the product might very well be the 2013 Champions Tri-Fold Nanograph Book Card. It comes with autographs from all nine of the 2013 UFC champs and is limited to just one copy. On the autographed memorabilia front, there are two per box. Numbered Autographed Fighter Relics are on the simple side of the high-end spectrum. Besides regular versions, there are Ruby Red (#/8) and Platinum (1/1) parallels. There are also Dual Autographed Relics (#/10) that are done as book cards and highlight a pair of fighters. Jumbo Fight Mat Relic Autographs are limited to 25 copies. The mat piece comes from a card they were featured on. 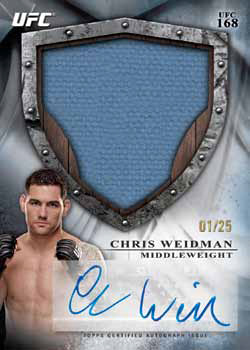 2013 Champion Fighter Autograph Relic book cards have a signature and two pieces from someone who held a belt in 2013. Numbered to 3, these are extremely tough to pull. Basic relic cards have a mix of fighter-worn gear and fight mats. Fighter Relics include pieces of shirts and shorts. There are also Dual Relics and Jumbo Relics. Fight Mat Relics have a piece of canvas from a match they fought in. Engraved Ingots is the lone manufactured relic in the product. The 25-card set uses engraved metal. All are numbered and have a Gold parallel (#/25). Sketch Cards return. 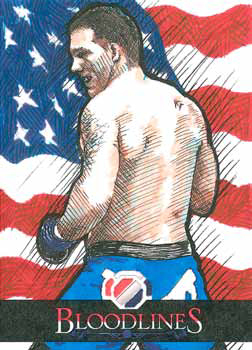 These have original art done directly on the card and center on the most popular UFC fighters and personalities. The 2014 Topps UFC Bloodlines base set has 150 cards. It's a combination of current champs, top contenders and young fighters. Numbered parallels, which combine at a rate of one per pack, include Flag, Black (#/25), Ruby Red (#/8) and Platinum (1/1). The set is rounded out by three basic insert sets. Bloodlines, the insert that went on to inspire the standalone brand, returns, once again focusing on birth countries. 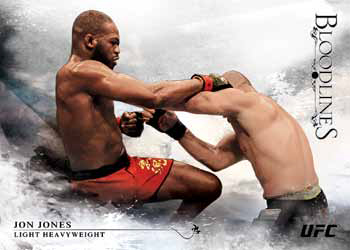 Historic Battles and New Guard are both new for 2014 Topps UFC Bloodlines. Historic Battles is a 25-card set that looks at classic match-ups. New Guard centers on rising stars. 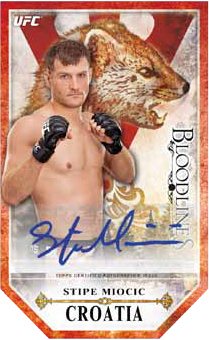 Bloodlines and New Guard cards also have autographed versions that are numbered to 50. Most of the cards are beautifully laid out and the photography is absolutely stunning, but some of the die cut cards seem like they tried to fit too much on the cards… A lot of arms cut off in the set. 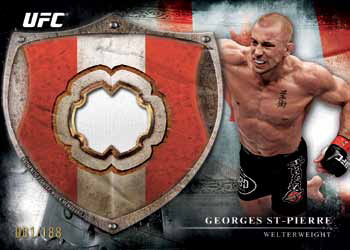 Each Hobby Box has an interesting variety of Relics and Autographs, but I was somewhat disappointed to get a crimped copy of a Georges St-Pierre die cut card. Overall, decent value for the price, IMHO. Any UFC fan will find something to delight.